"The Vikings went out and paid top dollar for the best quarterback to hit free agency since Peyton Manning." San Francisco opened last season 0-9, so it's premature to be bracketing them with the elite sides in this half of the league. But plenty of people do view them as dark horses among the assembled runners and riders this season. The optimism is based on the thoroughbred pedigree of two individuals. Quarterback Jimmy Garoppolo appears to be the young stud (no, this is not a comment on his personal life) that Bill Belichick et al believed him to be in New England. Impressive performances closing last season have seen expectations mount around Santa Clara to such an extent that the Niners have been bet down to as low as [18.00] for the Super Bowl in the offseason, although they have drifted since. Frisco's friskiness doesn't all rest on the 23-year-old signal-caller though. Coach Kyle Shanahan burnished his reputation as a offensive mastermind with a two-year stay in Atlanta as offensive coordinator that saw the Falcons come within a staggering comeback of their first Lombardi trophy thanks to their rampant scoring. This will be his second season in the Bay Area hot seat. His schemes took time to develop in Georgia before bearing fruit, so the reasoning goes that this year could see the likes of Marquise Goodwin, Trent Taylor, George Kittle, Jerick McKinnon (already lost to a season-ending injury), Matt Breida and Dante Pettis put up serious numbers with Shanny calling the shots and Jimmy G delivering them. If you're underwhelmed by that list of offensive talent, you won't be alone. For all the promise Garoppolo brings, the 49ers still look a work in progress. The defensive side of the ball also raises questions as we continue to wait for their heavy investment of draft capital to return dividends. Minnesota have no such worries. Indeed, the concern in the Great Lakes state may be that their team has over-ripened, having missed a prime opportunity to break their Super Bowl title duck last season - in their own stadium no less - with a humiliating loss in the NFC title game. If they have missed their window, it won't be for the want of trying. It would've been easy to allow quarterback Case Keenum to stick around after his season last year. It would've been nice to give Teddy Bridgewater the chance to steer this team to glory after two lost seasons due to a devastating knee injury. But the Vikings went out and paid top dollar for the best quarterback to hit free agency since Peyton Manning. Many people are still trying to understand why Washington just wouldn't pay Kirk Cousins what he wanted after his solid run in the capital. 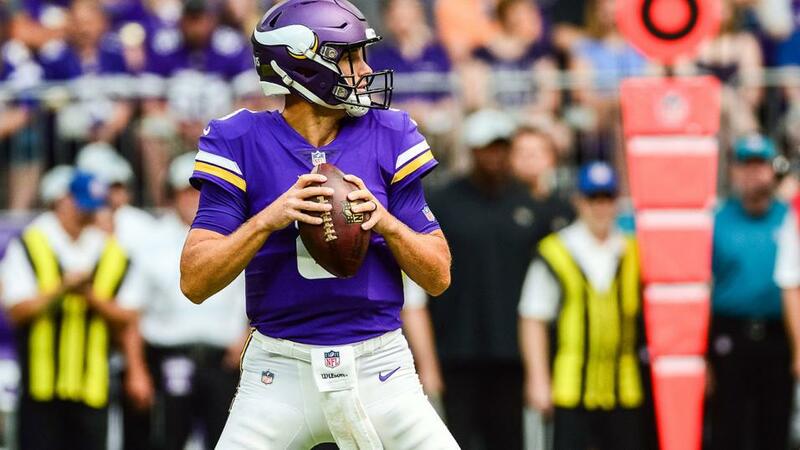 But DC's loss is MN's gain, and could be Cousins' too, as the Vikings are built to win now, with a great set of receivers, a strong backfield and one of the best defences in the league. If there are concerns, it's that they were too successful last year - they lost their offensive coordinator Pat Shurmur to the Giants head coaching gig - and that they've suffered some offensive line damage, with guard Nick Easton already out for the season, centre Pat Elflein is expected to miss week one, and there is uncertainty across the line about who will start where on Sunday. The line is a tough one on this, but has stayed under a converted touchdown at 6.5, so I'd favour the Minnesota side of this pairing. The o-line issues scare me. Cousins' last season in Washington was a relative decline compared to his previous largely because his line suffered so many injuries. Whether the Niners can take advantage is doubtful though. The Vikings look primed for a Super Bowl run, and you'd expect them to be much too good for San Fran side whose time should come, just not yet. I'd take them -6.5 here at [1.97]. The total points line looks to hinge on the Minnesota defence. They are an elite unit. Jimmy G impressed last season but they've a lot of changed pieces around him, so the Niners offence could bog down here. Last season, the Vikings were excellent at managing games and should be able to control this game, making the under on the points total an attractive play at [1.93].